Hi there – I’m writing on behalf of my parents. They started with bed bugs back in April 2017. They tried treating it on their own with no avail and around June started being bit by invisible bugs. They hired a pest control company to eradicate the bed bugs, which they did. However, they are still dealing with a mite or noseeum of some sort. They’ve had 2 opinions from pest control company’s and are being told dust mites but they don’t treat for that. They are at their wits end and need something to eradicate these mites. Can you provide some insight and advice for them? Thanks so much. There is a wide range of bugs which can cause issues for some people. In some cases allergies are involved; in other cases certain people can get targeted by a local insect but not everyone can be affected. More important is the fact that not everyone “reacts” the same to any one insect. Things can get even more muddled when the cause is not visible or what we call”unknown”. The good news is that if an insect is the root of the problem, then we know it must be either a crawling pest or a flying pest. Therefore, if you treat for both types, you’ll eliminate any potential for either species to be the cause. 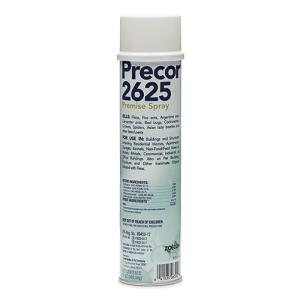 To accomplish this goal, first treat all flooring with PRECOR 2625. One can will treat up to 2625 sq/ft, is easy to apply and treatments will active for 2-4 weeks. 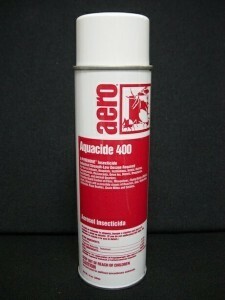 If a crawling insect is the cause of the problem, this treatment will eliminate the problem. Improvement will be immediately noticed but 2-4 treatments may be needed to break the established cycle. To control anything that might be in the air, you’ll need to use a space spray. These sprays are very different from what you use on the ground. Basically these treatments are designed to eliminate the “air” as a place for pests to live. In fact this is why so many “regular” treatments fail when dealing with an unknown pest. Spraying a liquid only covers a fraction of potential nest sites so if you have an unknown insect active in a structure, you need to treat everything. And this includes the air space. So to achieve this goal, the treatment must be safe enough to be used around people and yet strong enough to target the pest. For this reason, the best product for the job will be pyrethrin based spray like AQUACIDE. 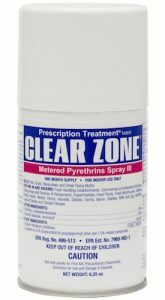 Effective for any kind of flying pest, a little bit of pyrethrin can go a long way. The only limit of pyrethrin is that it won’t last long once applied. In general, spraying a room 10 feet by 10 feet can be done with just a few seconds of spray. But it will only be active for 15-30 minutes. For this reason its important to keep renewing the material. This means you should plan on spraying several times a day. Minimally, treatments should be done every morning, afternoon and then again before you retire. One can will be enough to treat the average home for 1-2 weeks. A more “permanent” solution is to install AEROSOL MACHINES. These small devices are powered by batteries and can be set on shelf or mounted on the wall. One machine will cover up to 400 sq/ft. By default, they will release a small amount of product (less than a second release) every 15 minutes. These machines accept a small can of pyrethrin based aerosol that will control anything flying around, And because the treatment is constantly being renewed every 15 minutes, nothing will be able to use the air space being treated as long as the machines are kept running. Each machine will need a can of CLEAR ZONE aerosol. When set to go off every 15 minutes, one can will last 30 days. Plan on getting enough to run your machines for two months. Plan on treating for 1-2 months to ensure the problem is gone. It can sometimes take this long to break the life cycle of the problem pest. And if the problem comes back when you start treating, it means you need to get back on the program to stop it from returning. Lastly, installing FLYING INSECT TRAPS in any room with activity can be helpful. First, they’ll help by removing flying pests. Second, they’ll help by helping to identify the unknown entity. Run them around the clock or put them on a timer so they’re only at night. When run at night only, they’ll attract anything flying around and have the biggest impact.